The covered bridge capital of Ohio is adding another covered bridge. 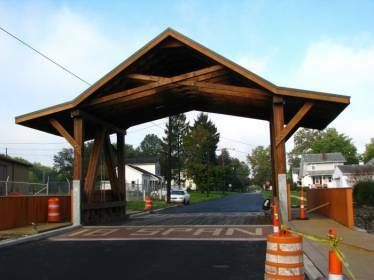 Ashtabula County in north east Ohio is adding its 18th covered bridge, the West Liberty Street Bridge. Already home to the longest covered bridge in the United States (Smolen-Gulf Bridge), this new bridge will be the shortest covered bridge in the United States at 18′ long. Portland Bolt has the distinction of supplying all of the bolts for both of these projects. All products are hot dip galvanized and 100% domestic. The truss rods for this project are 1-1/2 x 20′ A572 grade 50 and the timber bolts are 5/8″ and 3/4″ diameter. We also supplied galvanized high strength all thread rod and lag bolts and shipped the entire order in less than 3 weeks. The West Liberty Street Covered Bridge is being constructed almost entirely of locally sawn, donated local timber and is being fabricated with local labor by students at the Ashtabula County Joint Vocational School.